The sweater I want to share with you today is another linen knitted number and if you are counting then this will make it 3 linen jumpers this year ! (See here and here for the other two). I love each of them and have worn them a lot this summer. But my favourite is possibly this one and that is saying a lot. Why ? 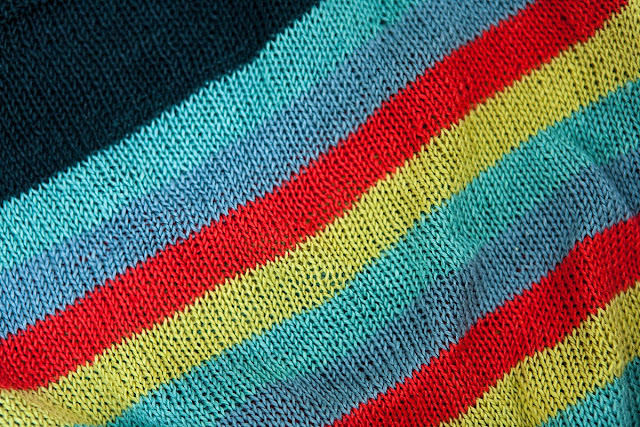 Because I actually am not that fond of stripes (or maybe I am a closeted stripe lover as my "Funky Granddad cardigan has plenty of those too). 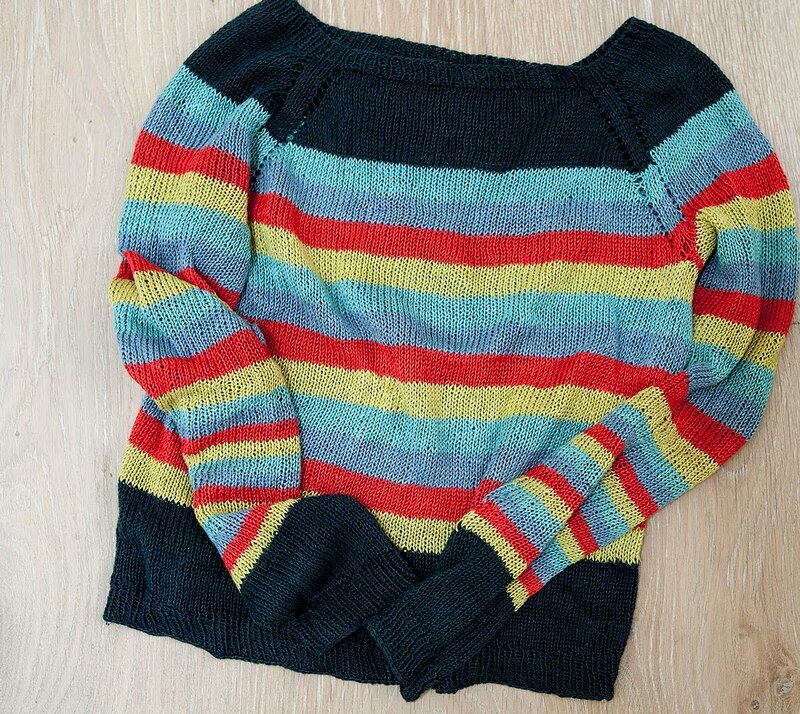 The pattern I followed is "Stripe Parade" from the Plucky Knitter . 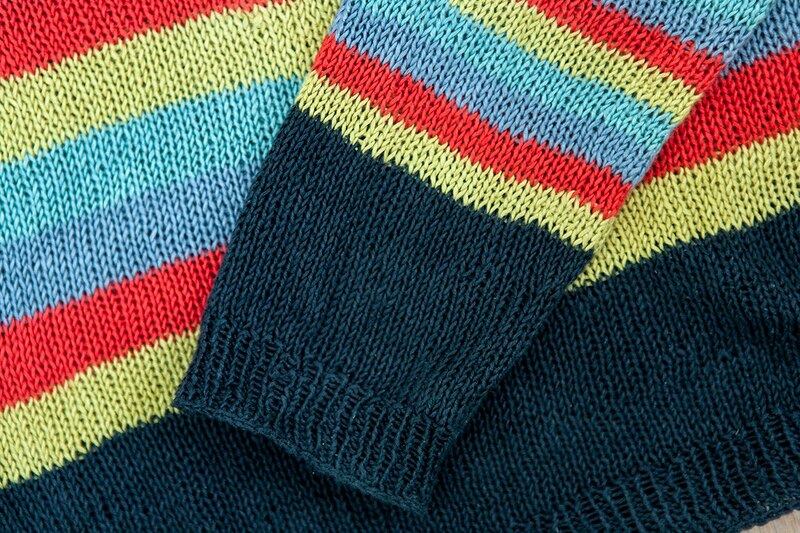 It is very easy to knit and the raglan sleeves make for a very good fit indeed. When I returned the leftover skeins from my other linen Quince&Co sweater to Loop, I spotted all these wonderful skeins and just could not resist to quickly grab a few and design there and then another project. If you are interested, the colours are 2 skeins of Fundi and one skein each of Hibiscus, Blue Spruce, Banyon and Citron. Although I would normally knit for a chest size 36, I knitted in the smallest size available as linen "grows" during knitting and while worn. And the sizing worked out perfectly. I also altered the stripe pattern to adjust for my taste and yarn availability.